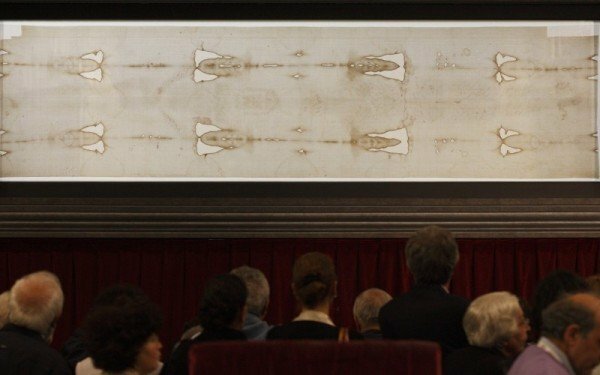 After a break of five years, the Shroud of Turin is back to public display at the city’s cathedral from April 19. The 4.4-metre-long (14-ft) cloth will be on show until June 24. Viewings are free but must be booked. Already one million people have signed up. Some devotees believe the shroud to be the burial cloth of Jesus Christ. Skeptics point to carbon dating that suggests it is a medieval forgery from the 1300s. Scientists have not agreed on how the image of a man was imprinted on the cloth. Pope Francis will be among those to view the shroud in a visit on June 21. The last public viewings were in 2010, when 2.5 million people came to see it. The Church has not officially claimed that Christ’s body was wrapped in the shroud, preferring instead to focus on what it means to those who see it. Archbishop of Turin Cesare Nosiglia said: “What counts the most is that this shroud… reflects in a clear and precise manner how the gospels describe the passion and death of Jesus. Archbishop Cesare Nosiglia said that many of those coming to see the shroud would be returnees. “That means there is a fundamental need in people’s hearts to renew this incredible experience that they had the first time they saw it,” he said. The shroud will be displayed in a climate-controlled case for 12 hours a day in Turin’s Cathedral of St John the Baptist.